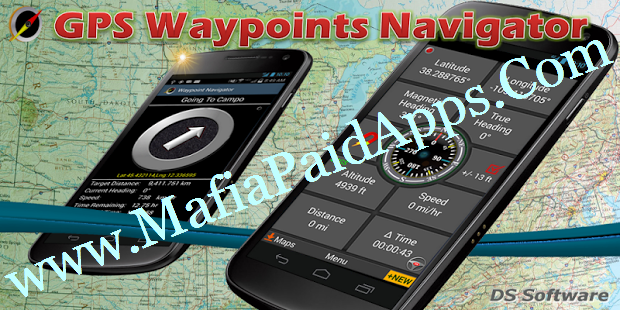 Convert your phone into the most powerful GPS for Android Powered Devices with GPS Waypoints Navigator. Whether you are navigating to a waypoint in the wilderness or in the city, GPS Waypoints Navigator will help you find the way. ✔️ Trail Hiking and Track Recording. ✔️ City and wilderness exploration. ★ Unlimited access to our vector map library with over 400 maps. Download maps for offline use. Transfer maps to your SD card to free-up internal memory. ★ No recurring costs or subscription fees. Everything is included with your original purchase. ★ Maps! Choose from multiple sources: Downloadable Vector Maps, Topo Maps, Google Maps, Satellite Maps, OpenStreetMaps- MapNik, Mapquest, Cycling Maps OpenSeaMap, USGS Topo Maps, NOAA Nautical Charts. ★ KML, KMZ & GPX file importing and exporting for trails and waypoints. Share data and view in Google Earth. ★ Exported GPX files may be uploaded to freelogbook.biz for company route tracking. ★ Marine Navigation. Features NOAA Nautical Charts, OpenSeaMap and nautical unit reporting. ★ Altitude profiling determined from your position matched to altitude values in land survey databases providing you with values that are more reliable than altitude values returned from your device's GPS chip. - Supports multiple languages: English, Spanish, German, Portuguese, Japanese, French, Italian, Russian, Chinese (traditional and simplified). - GPX, KML AND KMZ FILE HANDLING. EXPORT YOUR TRACKS AS A GPX FILE AND USE IT TO HELP BUILD OPENSTREETMAP. IMPORT GPX FILES FROM GARMIN. KML FILES ARE BEST FOR VIEWING IN GOOGLE EARTH. - ALTITUDE SUPPORT: Choose Satellite, United States Geologic Survey location based altitude or SRTM data. USGS available only in contiguous U.S.A, Canada and Mexico. V8.74 - REPLACED THE 2 DEAD MAPQUEST MAPS WITH TWO NEW HIGH-DEFINITION MAPS. V.8.71 - NOAA MARINE CHARTS (NO EXTRA CHARGE). V.8.64 - WAYPOINT PHOTOJOURNAL. ADD MULTIPLE PHOTOS AND NOTES TO ANY WAYPOINT. VIEW IN EDITABLE PHOTOJOURNAL. V.8.62 - SET APP LANGUAGE. V.8.60 - USGS TOPO MAPS. V.8.58 - HANDLES KMZ, KML, GPX FILES.